55th Birthday Cards. 55th Anniversary Cards. 1960 Trivia Playing Cards. 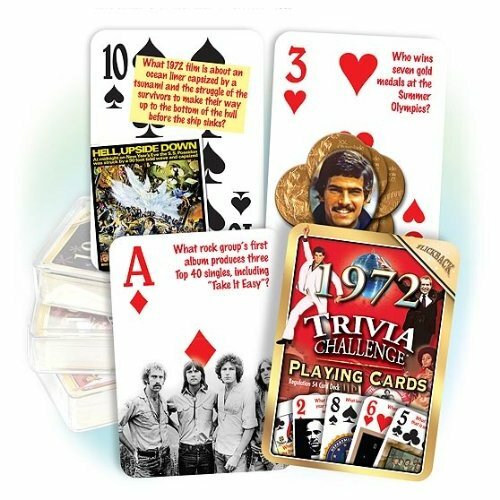 For a really great 55th birthday gift or a 55th anniversary gift you don't have to look further than these 1960 trivia playing cards! 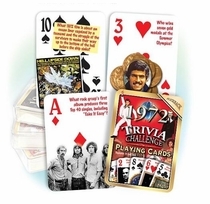 They'll be sure to jog the memories as each of the fifty-two cards have a 1960 trivia question and picture on them. Everyone will love these 55th birthday cards or 55th anniversary cards! Here are some sample 1960 trivia questions: Whose orchestra performed "Theme From A Summer Place" which won the 1960 Record of the Year Grammy? (Percy Faith), Which major league ballpark was demolished in Brooklyn, NY? (Ebbets Field).Where did a lunch counter sit-in that helped to launch the civil rights movement take place? (Greensboro, North Carolina). Which TV sitcom featuring Fred MacMurray as a widower raising three boys had its debut on CBS? (My Three Sons). Which artist's song, "It's Now or Never", was #1 on the U. S. charts for five weeks in a row? (Elvis Presley). Which TV series about a sheriff and his son made its debut on CBS? (The Andy Griffith Show). Which pizza delivery chain got its start this year? (Domino's Pizza). Which American female figure skater won the gold medal at the 1960 Winter Olympics? (Carol Heiss).